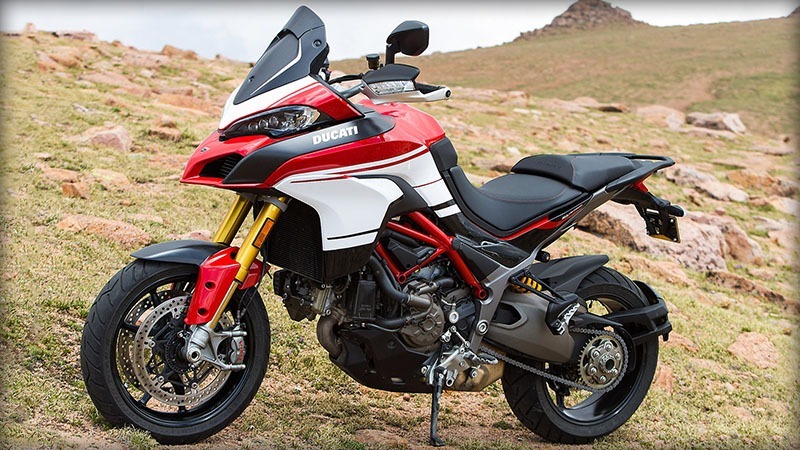 Ready to take on the toughest challenge, the new Multistrada 1200 Pikes Peak in Racing Livery boasts high performance specifications including a fully adjustable Öhlins fork and premium quality TTX36 rear shock. 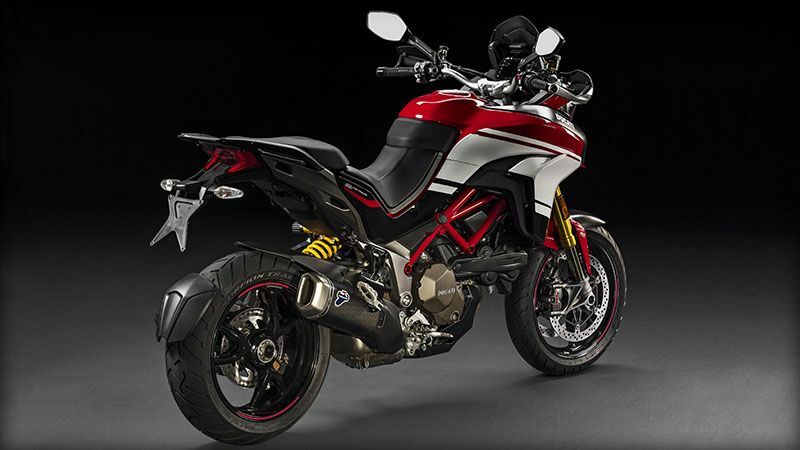 Ultralight carbon fiber componentry and the internationally homologated Ducati Performance by Termignoni carbon fiber silencer, enhance the motorcycle's competitive spirit. ADJUSTABLE SEAT: The Multistrada 1200 Pikes Peak seat provides an instant feeling of comfort and stirs up your desire to ride. Two independent seats for rider and passenger, designed with great attention to shape and foam density ensure excellent comfort also on long trips and excellent ground reach.The rider's seat is adjustable by ± 20 mm so that the standard seat height can be easily adjusted from the lower 825 mm position to 845 mm. 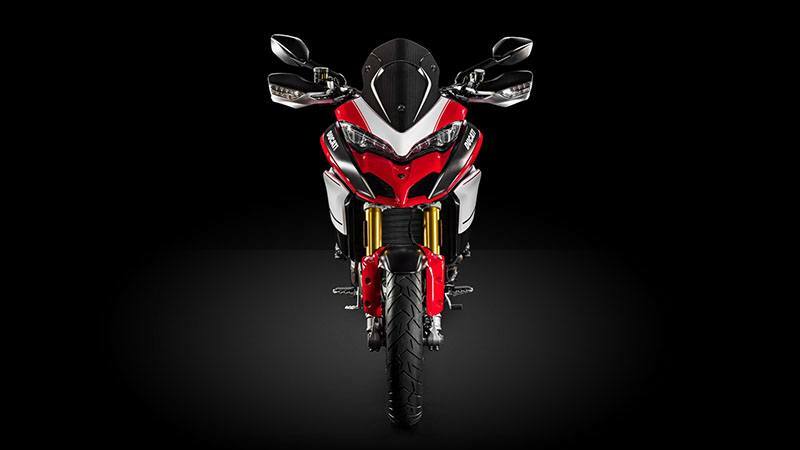 SUPERBIKE SPEC BREMBO BRAKING SYSTEM: The Multistrada 1200 Pikes Peak features a Superbike spec Brembo braking system composed by racing oriented PR 16 brake pump managing two Ø 330 mm front discs coupled with Superbike-spec Brembo Monobloc M50 calipers. 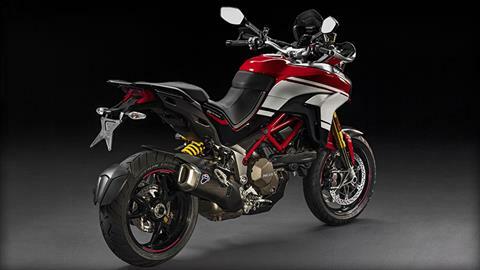 The rear performs with an huge single Æ 265 mm disc gripped by a single 2 x 28 floating Brembo caliper with sintered pads. 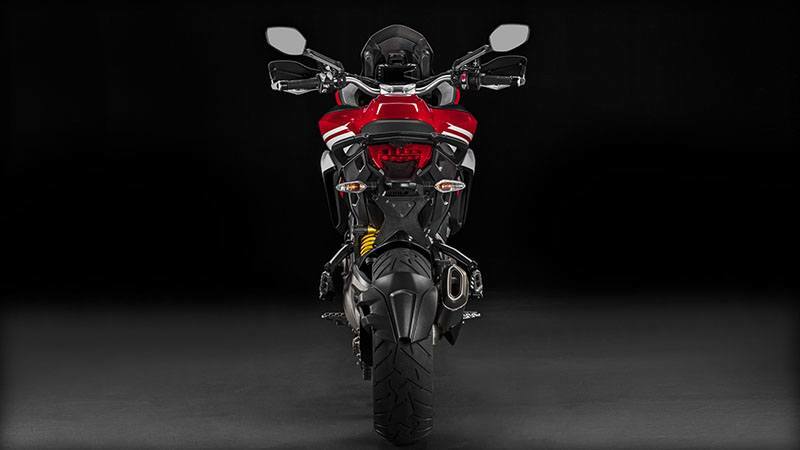 The performance of the brake system are supported by the 2 channels Bosh 9ME multi-calibrations ABS with cornering functionality that provides optimum braking even in bends. HIGH PERFORMANCE ÖHLINS SUSPENSION: High performance, manually adjustable Öhlins suspension front and back enhance handling and precision. The fork features preload and damping adjustment via the top cap, allowing riders to tailor the fork to their preference. 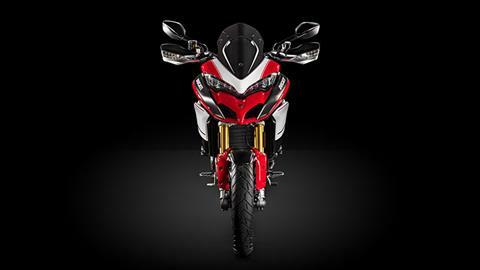 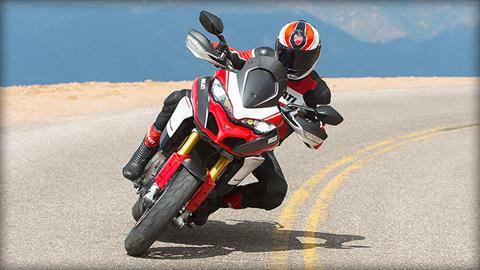 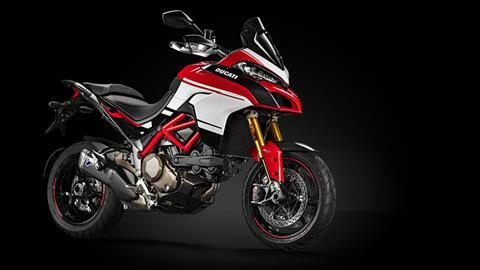 The gold finish also enhances the racing design of the Multistrada Pikes Peak. 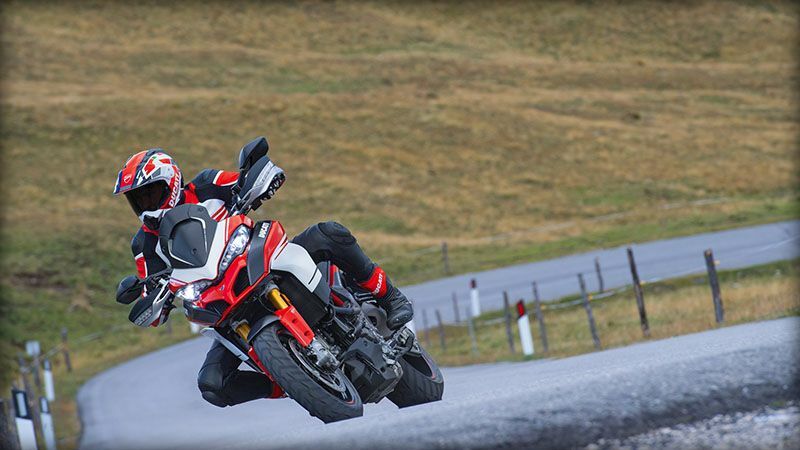 For superior dynamic behaviour the Multistrada Pikes Peak features an Öhlins TTX36 rear shock, improving feedback and control. 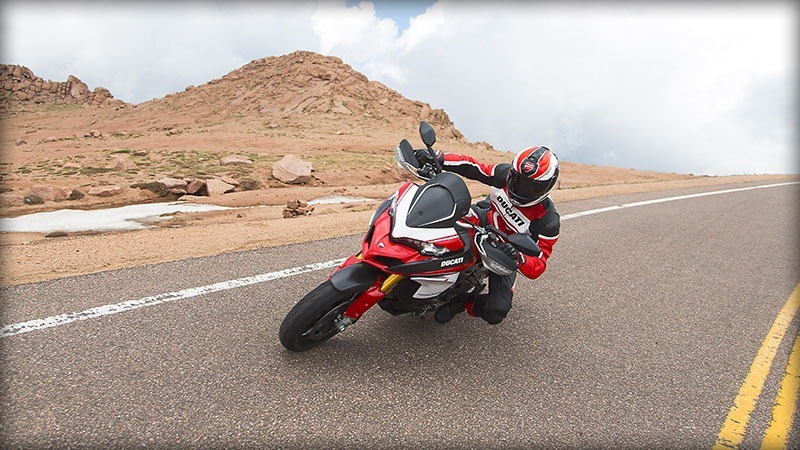 Individually manually adjustable compression and rebound damping, the TTX36 shock is developed to withstand the rigours of sporty on- and off-road use. 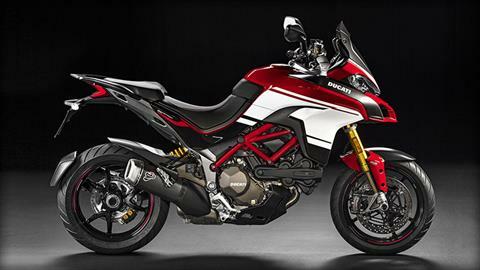 EXHAUST SYSTEM: The homologated carbon fibre Ducati Perfromance by Termignoni silencer adds an exciting exhaust note to the typical Ducati V-Twin sound. 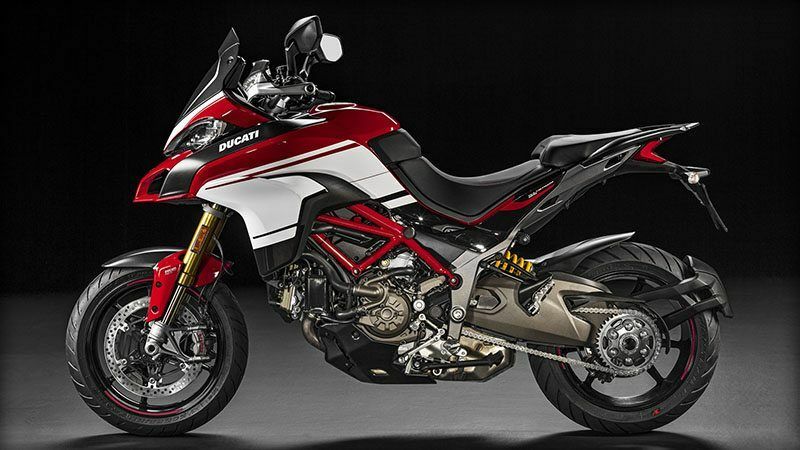 The main manifolds are channelled into the single 3-chamber collector box and accommodates cat converter and sound-deadening material.